Thank you for all of your patience with the load speeds of the blog. Tonight I was able to make some slight modifications to the display settings and page elements of the blog. As a result, you will should see improvements in the site's loading speeds. Any comments - positive or negative - on the site's loading speeds will be appreciated. Additionally, at this time I would especially invite you to share your general comments about the blog and general suggestions. I am looking to continue investing time in this site even as I expand my Catholic apostolate work with other new and exciting projects. Some of which, I will be promoting in the near future. Please pray for this seminarian who is in great need of our prayers. Here us a copy of the article that I read. I’ve written before about Philip Gerard Johnson, a terrific young man who was serving as a US naval officer when – as he records on his blog – he was diagnosed with inoperable brain cancer in 2008. His response was to enter a seminary, in the hope that he would be allowed the time to fulfil his greatest ambition: celebrating Mass in the traditional form of the Roman Rite that he loves so much. Philip has completed a year at seminary and was due to start a summer placement – but the latest scan shows that his tumour has grown and so he’ll be spending his time recuperating at a parish in North Carolina after gruelling treatment. As he says in his latest post, he’ll be taking “harsh chemotherapy drugs with very unpleasant side effects, and there are significant risks of internal bleeding and blood clots involved when taking them”. It’s a sad irony: a seminarian who represents the future of the Church, finds his own future threatened by illness. His blog, In Caritate Non Ficta, abounds with a good humour and spiritual serenity that very, very few of us could muster in his circumstances. Actually, given some of the recent comments that have appeared on this blog (and I have to take my full share of blame for this) it seems that even those of us in perfect health can’t manage even a shred of Philip’s charity. This latest medical setback makes me wonder whether, given the exceptional circumstances, the Church can’t hurry things on a little. (Maybe it’s a silly comparison, but John Henry Newman had been a Catholic for less than 18 months when he was ordained deacon one day and priest the next.) However, that’s really none of my business. What is my business, I think, is to encourage Christian readers of the blog to pray for Philip; and perhaps he will pray for us, too. I was recently given the opportunity to review the newly released book, Why God Matters: How to Recognize Him in Daily Life by Karina Lumbert Fabian and her father, Deacon Steven Lumbert. As state in the opening paragraph of the text, "In their collaboration, Why God Matters, Deacon Steven Lumbert and his daughter, Karina Lumbert Fabian, delineate the Catholic Faith as experienced by a par of average, everyday people like the great majority who make up the 24% of Americans who share this religion. The text was an extremely quick read as I read the 113 pages in 2 hours. 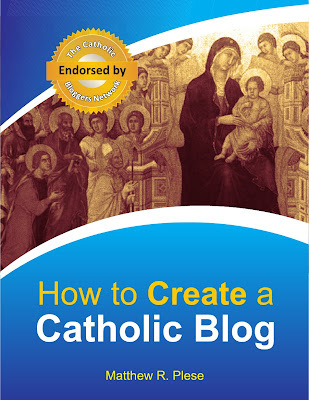 The book is not an academic work but rather is composed of extremely short (under 10 page) chapters describing the presence of Catholicism in each author's individual life. Throughout the text are references before each chapter to not only the Catechism of the Catholic Church but also the writings of the saints. Below are several images from today's Mass by His Holiness Pope Benedict XVI in Porto. This is the Holy Father's last Mass in Portugal during this trip. "It is written in the book of Psalms, … ‘His office let another take’. One of these men, then […] must become a witness with us to his resurrection" (Acts 1:20-22). These were the words of Peter, as he read and interpreted the word of God in the midst of his brethren gathered in the Upper Room following Jesus’ ascension to heaven. The one who was chosen was Matthias, who had been a witness to the public life of Jesus and his victory over death, and had remained faithful to him to the end, despite the fact that many abandoned him. The "disproportion" between the forces on the field, which we find so alarming today, astounded those who saw and heard Christ two thousand years ago. It was only he, from the shore of the Lake of Galilee right up to the squares of Jerusalem, alone or almost alone at the decisive moments: he, in union with the Father; he, in the power of the Spirit. Yet it came about, in the end, that from the same love that created the world, the newness of the Kingdom sprang up like a small seed which rises from the ground, like a ray of light which breaks into the darkness, like the dawn of a unending day: it is Christ Risen. And he appeared to his friends, showing them the need for the Cross in order to attain the resurrection. On that day Peter was looking for a witness to all this. Two were presented, and heaven chose "Matthias, and he was enrolled with the eleven apostles" (Acts 1:26). 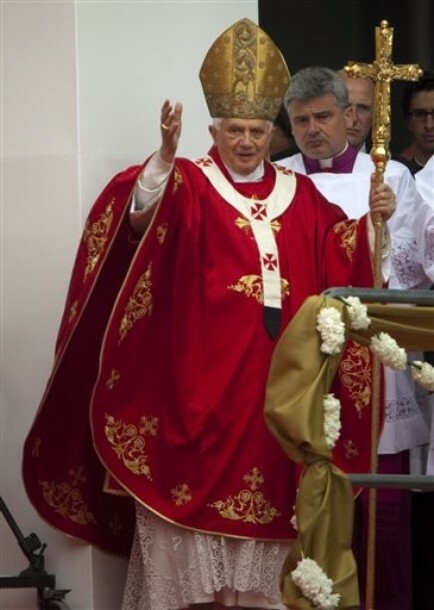 Today we celebrate his glorious memory in this "undefeated city", which festively welcomes the Successor of Peter. I give thanks to God that I have been able come here and meet you around the altar. 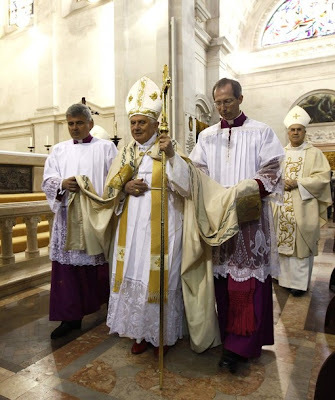 I offer a cordial greeting to you, my brethren and friends of the city and the Diocese of Oporto, to those who have come from the ecclesiastical province of Northern Portugal and from nearby Spain, and to all those physically or spiritually present at this liturgical assembly. I greet the Bishop of Oporto, Dom Manuel Clemente, who greatly desired this visit of mine, welcomed me with great affection, and voiced your sentiments at the beginning of this Eucharist. I greet his predecessors, his brother Bishops, all the priests, women and men religious, and the lay faithful, and in particular those actively involved in the Diocesan Mission, and, more concretely, in the preparations for my visit. I know that you have been able to count on the practical cooperation of the Mayor of Oporto and the public authorities, many of whom honour me by their presence; I wish to take advantage of this opportunity to greet them and to express to them, and to all whom they represent and serve, my best wishes for the good of all. 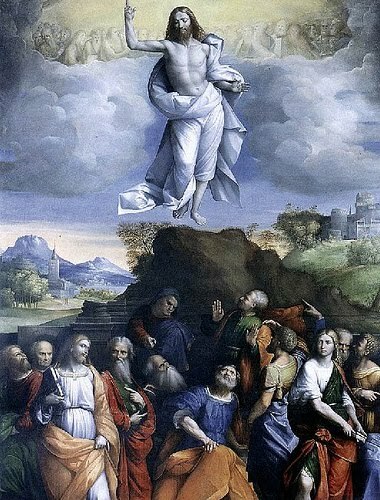 "One of these men must become with us a witness to his resurrection," said Peter. His Successor now repeats to each of you: My brothers and sisters, you need to become witnesses with me to the resurrection of Jesus. 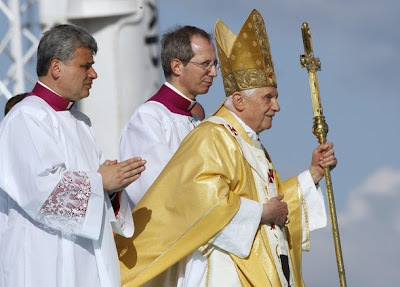 In effect, if you do not become his witnesses in your daily lives, who will do so in your place? Christians are, in the Church and with the Church, missionaries of Christ sent into the world. This is the indispensable mission of every ecclesial community: to receive from God and to offer to the world the Risen Christ, so that every situation of weakness and of death may be transformed, through the Holy Spirit, into an opportunity for growth and life. To this end, in every Eucharistic celebration, we will listen more attentively to the word of Christ and devoutly taste the bread of his presence. This will make us witnesses, and, even more, bearers of the Risen Jesus in the world, bringing him to the various sectors of society and to all those who live and work there, spreading that "life in abundance" (cf. Jn 10:10) which he has won for us by his cross and resurrection, and which satisfies the most authentic yearnings of the human heart. We impose nothing, yet we propose ceaselessly, as Peter recommends in one of his Letters: "In your hearts, reverence Christ as Lord. Always be prepared to make a defence to any one who calls you to account for the hope that is in you" (1 Pet 3:15). And everyone, in the end, asks this of us, even those who seem not to. From personal and communal experience, we know well that it is Jesus whom everyone awaits. In fact, the most profound expectations of the world and the great certainties of the Gospel meet in the ineluctable mission which is ours, for "without God man neither knows which way to go, nor even understands who he is. In the face of the enormous problems surrounding the development of peoples, which almost make us yield to discouragement, we find solace in the sayings of our Lord Jesus Christ, who teaches us: ‘Apart from me you can do nothing’ (Jn 15:5) and who encourages us: ‘I am with you always, to the close of the age’ (Mt 28:20)" (Caritas in Veritate, 78). This is the mandate whose faithful fulfilment "must follow the road Christ himself walked, a way of poverty and obedience, of service and of self-sacrifice even unto death, a death from which he emerged victorious by his resurrection" (Ad Gentes, 5). Yes! We are called to serve the humanity of our own time, trusting in Jesus alone, letting ourselves be enlightened by his word: "You did not choose me, but I chose you and appointed you that you should go and bear fruit and that your fruit should abide" (Jn 15:16). How much time we have lost, how must work has been set back, on account of our lack of attention to this point! Everything is to be defined starting with Christ, as far as the origins and effectiveness of mission is concerned: we receive mission always from Christ, who has made known to us what he has heard from his Father, and we are appointed to mission through the Spirit, in the Church. Like the Church herself, which is the work of Christ and his Spirit, it is a question of renewing the face of the earth starting from God, God always and alone. Dear brothers and sisters of Oporto, lift up your eyes to the One whom you have chosen as the patroness of your city, the Immaculate Conception. The angel of the Annunciation greeted Mary as "full of grace", signifying with this expression that her heart and her life were totally open to God and, as such, completely permeated by his grace. May Our Lady help you to make yourselves a free and total "Yes" to the grace of God, so that you can be renewed and thus renew humanity by the light and the joy of the Holy Spirit. 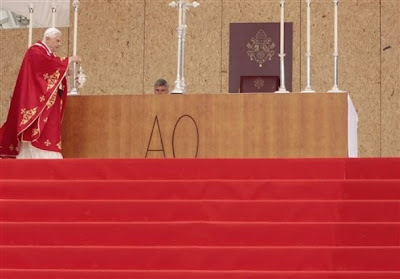 I am happy to be among you and I thank you for the festive and cordial welcome which I have received here in Oporto, the "City of the Virgin." 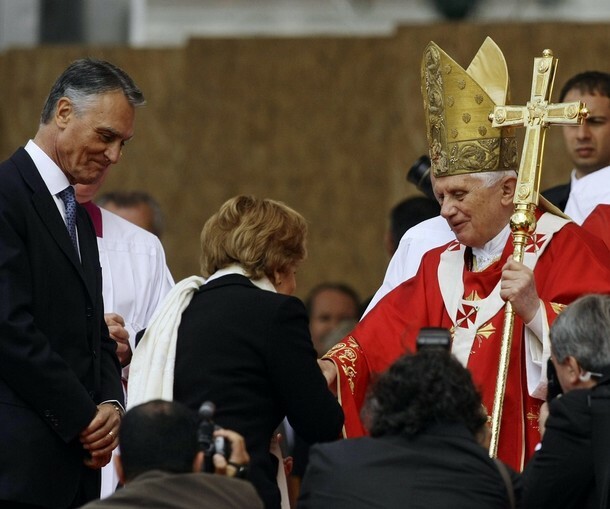 To her motherly protection I entrust you and your families, your communities and institutions serving the common good, including the universities of the city whose students have gathered to show me their gratitude and their attachment to the teaching of the Successor of Peter. Thank you for your presence and for the witness of your faith. I also thank again those who worked in various ways preparing and realizing my visit, especially the preparations made in prayer. I would have happily prolonged my stay in your city, but it is not possible. So let me take my leave of you, embracing each one of you affectionately in Christ our Hope, as I give you my blessing in the name of the Father and of the Son and of the Holy Spirit. 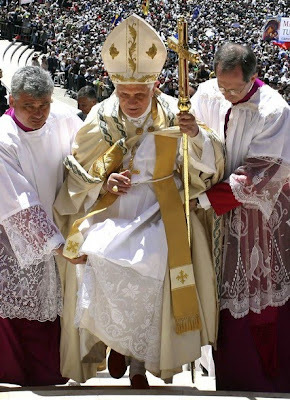 Following my coverage as of late on the Ambrosian Rite, I wish to share this video from a Solemn Ambrosian Rite Mass celebrated on May 2, 2010, in the Pantheon. "Their descendants shall be renowned among the nations [...], they are a people whom the Lord has blessed" (Is 61:9). So the first reading of this Eucharist began, and its words are wonderfully fulfilled in this assembly devoutly gathered at the feet of Our Lady of Fatima. Dearly beloved brothers and sisters, I too have come as a pilgrim to Fatima, to this "home" from which Mary chose to speak to us in modern times. I have come to Fatima to rejoice in Mary's presence and maternal protection. I have come to Fatima, because today the pilgrim Church, willed by her Son as the instrument of evangelization and the sacrament of salvation, converges upon this place. I have come to Fatima to pray, in union with Mary and so many pilgrims, for our human family, afflicted as it is by various ills and sufferings. 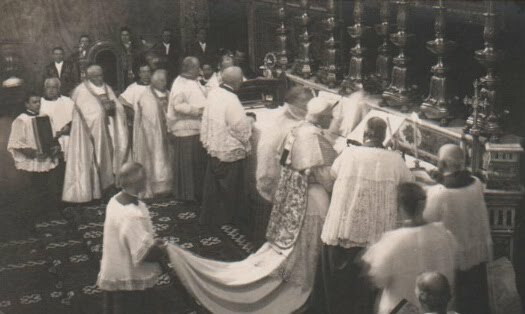 Finally, I have come to Fatima with the same sentiments as those of Blessed Francisco and Jacinta, and the Servant of God Lúcia, in order to entrust to Our Lady the intimate confession that "I love" Jesus, that the Church and priests "love" him and desire to keep their gaze fixed upon him as this Year for Priests comes to its end, and in order to entrust to Mary's maternal protection priests, consecrated men and women, missionaries and all those who by their good works make the House of God a place of welcome and charitable outreach. Yes! The Lord, our great hope, is with us. In his merciful love, he offers a future to his people: a future of communion with himself. After experiencing the mercy and consolation of God who did not forsake them along their wearisome return from the Babylonian Exile, the people of God cried out: "I greatly rejoice in the Lord, my whole being exults in my God" (Is 61:10). The resplendent daughter of this people is the Virgin Mary of Nazareth who, clothed with grace and sweetly marvelling at God's presence in her womb, made this joy and hope her own in the canticle of the Magnificat: "My spirit rejoices in God my Saviour". She did not view herself as a fortunate individual in the midst of a barren people, but prophecied for them the sweet joys of a wondrous maternity of God, for "his mercy is for those who fear him from generation to generation" (Lk 1:47, 50). This holy place is the proof of it. In seven years you will return here to celebrate the centenary of the first visit made by the Lady "come from heaven", the Teacher who introduced the little seers to a deep knowledge of the Love of the Blessed Trinity and led them to savour God himself as the most beautiful reality of human existence. This experience of grace made them fall in love with God in Jesus, so much so that Jacinta could cry out: "How much I delight in telling Jesus that I love him! When I tell him this often, I feel as if I have a fire in my breast, yet it does not burn me". And Francisco could say: "What I liked most of all was seeing Our Lord in that light which Our Mother put into our hearts. I love God so much!" (Memoirs of Sister Lúcia, I, 42 and 126). Brothers and sisters, in listening to these innocent and profound mystical confidences of the shepherd children, one might look at them with a touch of envy for what they were able to see, or with the disappointed resignation of someone who was not so fortunate, yet still demands to see. To such persons, the Pope says, as does Jesus: "Is not this the reason you are wrong, that you know neither the Scriptures nor the power of God?" (Mk 12:24). The Scriptures invite us to believe: "Blessed are those who have not seen and yet have come to believe" (Jn 20:29), but God, who is more deeply present to me than I am to myself (cf. Saint Augustine, Confessions, III, 6, 11) - has the power to come to us, particularly through our inner senses, so that the soul can receive the gentle touch of a reality which is beyond the senses and which enables us to reach what is not accessible or visible to the senses. For this to happen, we must cultivate an interior watchfulness of the heart which, for most of the time, we do not possess on account of the powerful pressure exerted by outside realities and the images and concerns which fill our soul (cf. Theological Commentary on The Message of Fatima, 2000). Yes! God can come to us, and show himself to the eyes of our heart. Moreover, that Light deep within the shepherd children, which comes from the future of God, is the same Light which was manifested in the fullness of time and came for us all: the Son of God made man. He has the power to inflame the coldest and saddest of hearts, as we see in the case of the disciples on the way to Emmaus (cf. Lk 24:32). Henceforth our hope has a real foundation, it is based on an event which belongs to history and at the same time transcends history: Jesus of Nazareth. The enthusiasm roused by his wisdom and his saving power among the people of that time was such that a woman in the midst of the crowd - as we heard in the Gospel - cried out: "Blessed is the womb that bore you, and the breasts that nursed you!". And Jesus said: "Blessed rather are those who hear the word of God and obey it!" (Lk 11:27-28). But who finds time to hear God's word and to let themselves be attracted by his love? Who keeps watch, in the night of doubt and uncertainty, with a heart vigilant in prayer? Who awaits the dawn of the new day, fanning the flame of faith? Faith in God opens before us the horizon of a sure hope, one which does not disappoint; it indicates a solid foundation on which to base one's life without fear; it demands a faith-filled surrender into the hands of the Love which sustains the world. "Their descendants shall be known among the nations, [...] they are a people whom the Lord has blessed" (Is 61:9) with an unshakable hope which bears fruit in a love which sacrifices for others, yet does not sacrifice others. Rather, as we heard in the second reading, this love "bears all things, believes all things, hopes all things, endures all things" (1 Cor 13:7). An example and encouragement is to be found in the shepherd children, who offered their whole lives to God and shared them fully with others for love of God. Our Lady helped them to open their hearts to universal love. Blessed Jacinta, in particular, proved tireless in sharing with the needy and in making sacrifices for the conversion of sinners. 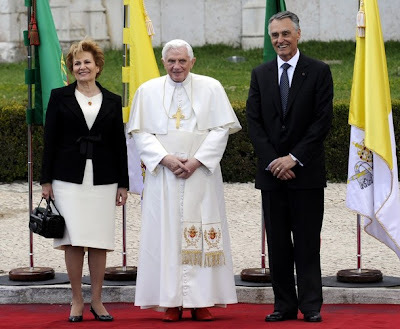 Only with this fraternal and generous love will we succeed in building the civilization of love and peace. We would be mistaken to think that Fatima's prophetic mission is complete. Here there takes on new life the plan of God which asks humanity from the beginning: "Where is your brother Abel [...] Your brother's blood is crying out to me from the ground!" (Gen 4:9). Mankind has succeeded in unleashing a cycle of death and terror, but failed in bringing it to an end... 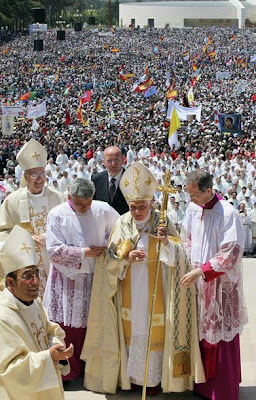 In sacred Scripture we often find that God seeks righteous men and women in order to save the city of man and he does the same here, in Fatima, when Our Lady asks: "Do you want to offer yourselves to God, to endure all the sufferings which he will send you, in an act of reparation for the sins by which he is offended and of supplication for the conversion of sinners?" (Memoirs of Sister Lúcia, I, 162). All of you, standing together with lighted candles in your hands, seem like a sea of light around this simple chapel, lovingly built to the honour of the Mother of God and our mother, whose path from earth to heaven appeared to the shepherd children like a way of light. However, neither Mary nor we have a light of our own: we receive it from Jesus. His presence within us renews the mystery and the call of the burning bush which once drew Moses on Mount Sinai and still fascinates those aware of the light within us which burns without consuming us (cf. Ex 3:2-5). We are merely a bush, but one upon which the glory of God has now come down. 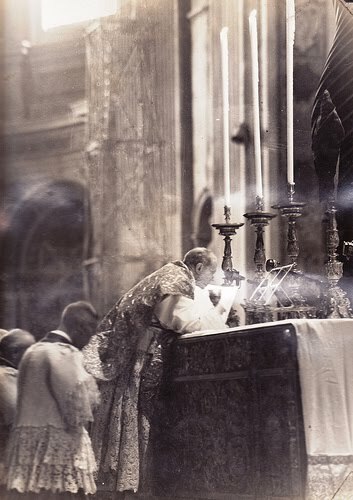 To him therefore be every glory, and to us the humble confession of our nothingness and the unworthy adoration of the divine plan which will be fulfilled when "God will be all in all" (cf. 1 Cor 15:28). The matchless servant of that plan was the Virgin full of grace: "Behold the handmaid of the Lord: let it be done to me according to your word" (Lk 1:38). Dear pilgrims, let us imitate Mary, letting her words "Let it be done to me" resound in our lives. God ordered Moses: "Take off your shoes, for the place on which you stand is holy ground" (Ex3:5). And that is what he did: he would put his shoes back on to free his people from slavery in Egypt and to guide them to the promised land. This was not about the possession of a parcel of land or about the national territory to which every people has a right; in the struggle for the freedom of Israel and in the exodus from Egypt, what appears central is above all the freedom to worship, the freedom of a religion of one’s own. Throughout the history of the chosen people, the promise of a homeland comes more and more to mean this: the land is granted in order to be a place of obedience, a window open to God. In our time, in which the faith in many places seems like a light in danger of being snuffed out forever, the highest priority is to make God visible in the world and to open to humanity a way to God. And not to any god, but to the God who had spoken on Sinai; the God whose face we recognize in the love borne to the very end (cf. Jn 13:1) in Jesus Christ, crucified and risen. Dear brothers and sisters, worship Christ the Lord in your hearts (cf. 1 Pet 3:15)! Do not be afraid to talk of God and to manifest without fear the signs of faith, letting the light of Christ shine in the presence of the people of today, just as the Church which gives birth to humanity as the family of God sings on the night of the Easter Vigil. Brothers and sisters, in this place it is amazing to think how three children entrusted themselves to the interior force which had enflamed them in the apparitions of the Angel and of our heavenly Mother. 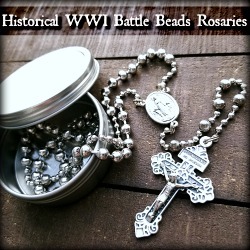 In this place where we were repeatedly requested to recite the rosary, let us allow ourselves to be attracted by the mysteries of Christ, the mysteries of Mary’s rosary. The recitation of the rosary allows us to fix our gaze and our hearts upon Jesus, just like his Mother, the supreme model of contemplation of the Son. Meditating upon the joyful, luminous, sorrowful and glorious mysteries as we pray our Hail Marys, let us reflect upon the interior mystery of Jesus, from the Incarnation, through the Cross, to the glory of the Resurrection; let us contemplate the intimate participation of Mary in the mystery of our life in Christ today, a life which is also made up of joy and sorrow, of darkness and light, of fear and hope. Grace invades our hearts, provoking a wish for an incisive and evangelical change of life so that we can say with Saint Paul: "For me to live is Christ" (Phil 1:21) in a communion of life and destiny with Christ. 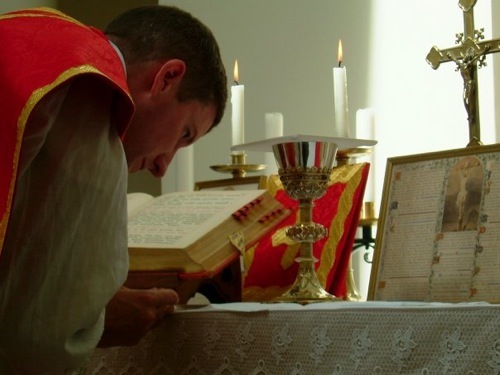 I have blogged previously on the ancient Ambrosian Rite, and I am pleased to see that Vespers in the ancient Ambrosian rite took place in Rome earlier this month. Below is the video of the occassion. 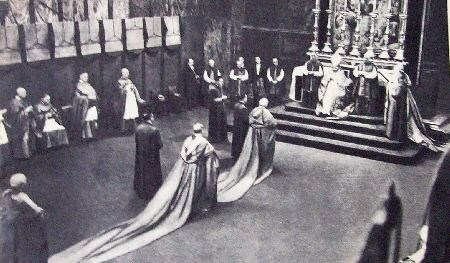 And, please read my prior post if you have not yet done so on The Traditional Ambrosian Rite. Alleluia, alleluia. V.: God is ascended with a shout, and the Lord with the sound of a trumpet. Alleluia. V.: (Ps. 67. 18). The Lord is in Sinai, in the holy place; ascending on high He hath led captivity captive. The mystery of our salvation, dearly-beloved, which the Creator of the universe valued at the price of His blood, has now been carried out under conditions of humiliation from the day of His bodily birth to the end of His Passion. And although even in "the form of a slave" many signs of Divinity have beamed out, yet the events of all that period served particularly to show the reality of His assumed Manhood. But after the Passion, when the chains of death were broken, which had exposed its own strength by attacking Him, Who was ignorant of sin, weakness was turned into power, mortality into eternity, contumely into glory, which the Lord Jesus Christ showed by many clear proofs in the sight of many, until He carried even into heaven the triumphant victory which He had won over the dead. 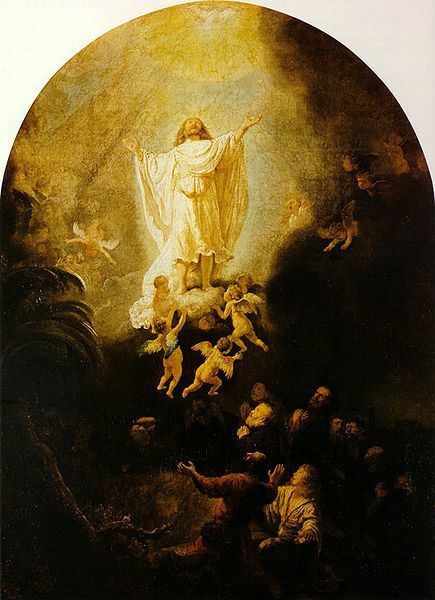 As therefore at the Easter commemoration, the Lord's Resurrection was the cause of our rejoicing; so the subject of our present gladness is His Ascension, as we commemorate and duly venerate that day on which the Nature of our humility in Christ was raised above all the host of heaven, over all the ranks of angels, beyond the height of all powers, to sit with God the Father. On which Providential order of events we are founded and built up, that God's Grace might become more wondrous, when, notwithstanding the removal from men's sight of what was rightly felt to command their awe, faith did not fail, hope did not waver, love did not grow cold. For it is the strength of great minds and the light of firmly-faithful souls, unhesitatingly to believe what is not seen with the bodily sight, and there to fix one's affections whither you cannot direct your gaze. And whence should thisGodliness spring up in our hearts, or how should a man be justified by faith, if our salvation rested on those things only which lie beneath our eyes? Hence our Lord said to him who seemed to doubt of Christ's Resurrection, until he had tested by sight and touch the traces of His Passion in His very Flesh, "because you have seen Me, you have believed: blessed are they who have not seen and yet have believed John 20:29 ." The Son of Man and Son of God, therefore, dearly-beloved, then attained a more excellent and holier fame, when He betook Himself back to the glory of the Father's Majesty, and in an ineffable manner began to be nearer to the Father in respect of His Godhead, after having become farther away in respect of His manhood. A better instructed faith then began to draw closer to a conception of the Son's equality with the Father without the necessity of handling the corporeal substance in Christ, whereby He is less than the Father, since, while the Nature of the glorified Body still remained the faith of believers was called upon to touch not with the hand of flesh, but with the spiritual understanding the Only-begotten, Who was equal with the Father. Hence comes that which the Lord said after His Resurrection, when Mary Magdalene, representing the Church, hastened to approach and touch Him: "Touch Me not, for I have not yet ascended to My Father John 20:17:" that is, I would not have you come to Me as to a human body, nor yet recognize Me by fleshly perceptions: I put you off for higher things, I prepare greater things for you: when I have ascended to My Father, then you shall handle Me more perfectly and truly, for you shall grasp what you can not touch and believe what you can not see. But when the disciples' eyes followed the ascending Lord to heaven with upward gaze of earnest wonder, two angels stood by them in raiment shining with wondrous brightness, who also said, "You men of Galilee, why do you stand gazing into heaven? This Jesus Who was taken up from you into heaven shall so come as you saw Him going into heaven Acts 1:11 ." By which words all the sons of the Church were taught to believe that Jesus Christ will come visibly in the same Flesh wherewith He ascended, and not to doubt that all things are subjected to Him on Whom the ministry of angels had waited from the first beginning of His Birth. For, as an angel announced to the blessed Virgin that Christ should be conceived by the Holy Ghost, so the voice of heavenly beings sang of His being born of the Virgin also to the shepherds. As messengers from above were the first to attest His having risen from the dead, so the service of angels was employed to foretell His coming in very Flesh to judge the world, that we might understand what great powers will come with Him as Judge, when such great ones ministered to Him even in being judged. And so, dearly-beloved, let us rejoice with spiritual joy, and let us with gladness pay God worthy thanks and raise our hearts' eyes unimpeded to those heights where Christ is. Minds that have heard the call to be uplifted must not be pressed down by earthly affections , they that are fore-ordained to things eternal must not be taken up with the things that perish; they that have entered on the way of Truth must not be entangled in treacherous snares, and the faithful must so take their course through these temporal things as to remember that they are sojourning in the vale of this world, in which, even though they meet with some attractions, they must not sinfully embrace them, but bravely pass through them. For to this devotion the blessed Apostle Peter arouses us, and entreating us with that loving eagerness which he conceived for feeding Christ's sheep by the threefold profession of love for the Lord, says, "dearly-beloved, I beseech you, as strangers and pilgrims, abstain from fleshly lusts which war against the soul 1 Peter 2:11 ." But for whom do fleshly pleasures wage war, if not for the devil, whose delight it is to fetter souls that strive after things above, with the enticements of corruptible good things, and to draw them away from those abodes from which he himself has been banished? Against his plots every believer must keep careful watch that he may crush his foe on the side whence the attack is made. And there is no more powerful weapon, dearly-beloved, against the devil's wiles than kindly mercy and bounteous charity, by which every sin is either escaped or vanquished. But this lofty power is not attained until that which is opposed to it be overthrown. And what so hostile to mercy and works of charity as avarice from the root of which spring all evils ? And unless it be destroyed by lack of nourishment, there must needs grow in the ground of that heart in which this evil weed has taken root, the thorns and briars of vices rather than any seed of true goodness. Let us then, dearly-beloved, resist this pestilential evil and "follow after charity ," without which no virtue can flourish, that by this path of love whereby Christ came down to us, we too may mount up to Him, to Whom with God the Father and the Holy Spirit is honour and glory for ever and ever. Amen. The Ascension has been called the capstone of the life of Jesus, but Jesus is not gone completely! 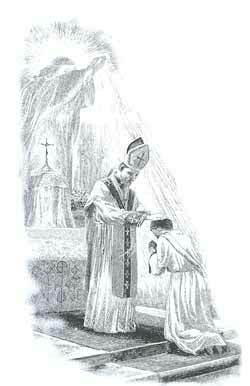 He has promised to remain with us till the end of the ages, and He does this by the Holy Eucharist. 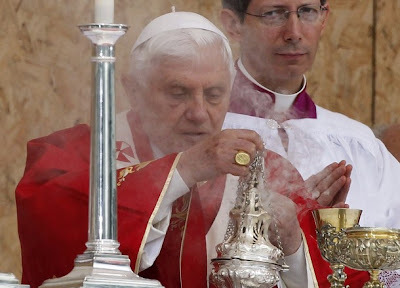 Jesus Christ is in the Holy Eucharist. When Jesus was speaking of the Eucharist, His disciples were murmuring about having to eat His flesh. Jesus said to them, "Does this offend you? Then how will you react when you see the Son of Man ascending to where he was before?" (Jn.6:61-62). Jesus is still with us and shall remain with us. He looks out for us and loves us. Jesus is Our God forever and ever! Let us go forth this day still in the Easter Joy. We are sinners, but, if we are repentant and seek Our Lord in the Sacrament of Confession, then we can be forgiven. Jesus gave us the Sacraments and the Church through His disciples for this day - the day He would ascend bodily into Heaven. How glorious it must have been! Christ is said to sit at the Father's right hand inasmuch as He is on equality with the Father in respect of His Divine Nature, while in respect of His humanity, He excels all creatures in the possession of Divine gifts. But each of these belongs exclusively to Christ. Consequently, it belongs to no one else, angel or man, but to Christ alone, to sit at the right hand of the Father. 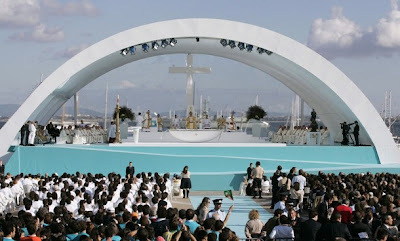 Homily at the Mass in in Lisbon's Commerce Square, also known as Palace Square. Unfortunately, it seems that despite the holy words mentioned above and the pictures within it, this Mass was another occassion of liturgical abuses and irreverence to our Lord Jesus Christ. For example, look at the irreverence toward Our Blessed Lord, truly present in the Holy Eucharist. 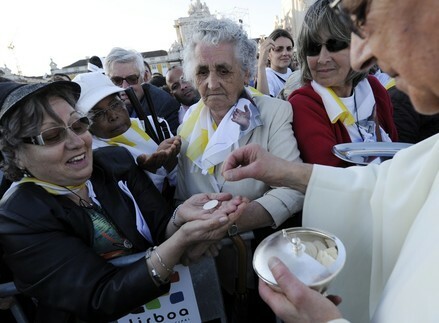 Our Lord has come down from Heaven to dwell among us in the Heavenly Sacrament and instead of receiving it as one ought - whilst kneeling - these women take as it one would take ordinary bread. 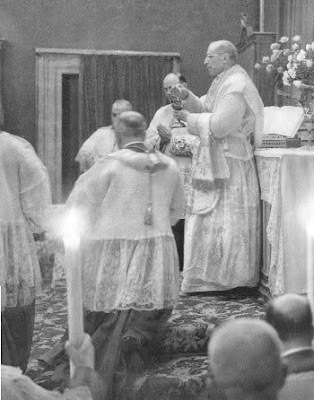 I see this as an occassion to pray for the revival of Traditional Catholicism and true values that don't change with time, such as reverence for the Blessed Sacrament and piety. Since the earliest days of their nationhood, the Portuguese people have looked to the Successor of Peter for recognition of their existence as a Nation; in due course, one of my predecessors was to honour Portugal, in the person of its King, with the title "most faithful" (cf. Pius II, Bull Dum Tuam, 25 January 1460), for long and distinguished service to the cause of the Gospel. As for the event that took place 93 years ago, when heaven itself was opened over Portugal -- like a window of hope that God opens when man closes the door to him -- in order to refashion, within the human family, the bonds of fraternal solidarity based on the mutual recognition of the one Father, this was a loving design from God; it does not depend on the Pope, nor on any other ecclesial authority: "It was not the Church that imposed Fatima", as Cardinal Manuel Cerejeira of blessed memory used to say, "but it was Fatima that imposed itself on the Church." The Virgin Mary came from heaven to remind us of Gospel truths that constitute for humanity -- so lacking in love and without hope for salvation -- the source of hope. To be sure, this hope has as its primary and radical dimension not the horizontal relation, but the vertical and transcendental one. The relationship with God is constitutive of the human being, who was created and ordered towards God; he seeks truth by means of his cognitive processes, he tends towards the good in the sphere of volition, and he is attracted by beauty in the aesthetic dimension. Consciousness is Christian to the degree to which it opens itself to the fullness of life and wisdom that we find in Jesus Christ. The visit that I am now beginning under the sign of hope is intended as a proposal of wisdom and mission. Zenit offers the following article in response to some of the comments of Cardinal Sean Brady. I have emphasized some especially key points. Teaching prayer in Catholic schools is not an extra feature, but rather an essential part of the institutions, which children have a right to receive, said Cardinal Sean Brady. The archbishop of Armagh and Primate of All Ireland stated this today at a conference on the theme, "Catholic Schools: Envisioning a Future," near Kilkenny. The conference was organized by the Diocese of Ossory and will end Saturday. He invited his listeners to renew their commitment to "respecting and promoting the right of children in our schools to be led and formed in authentic worship of God in the Catholic tradition." "This is not some optional extra," the prelate asserted. 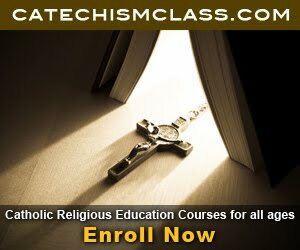 "Children and their parents have a right to expect a Catholic school to provide children with a formation in prayer and worship." He appealed to the leaders of the educational institutions "reflect seriously and with commitment on this essential part of our shared duty of stewardship." 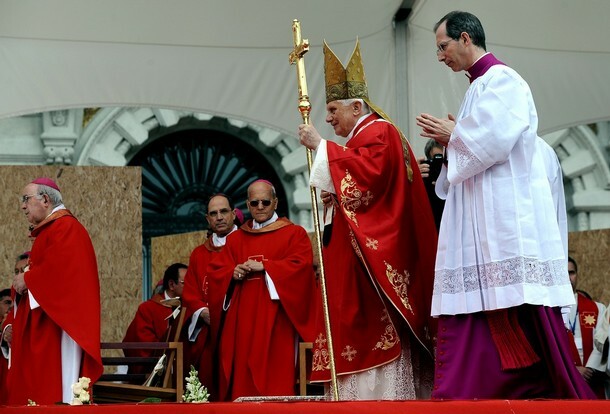 "A Catholic school without worship and prayer is a contradiction in terms," the cardinal said. "It is also a school which is failing in its fundamental obligation to parents and children." 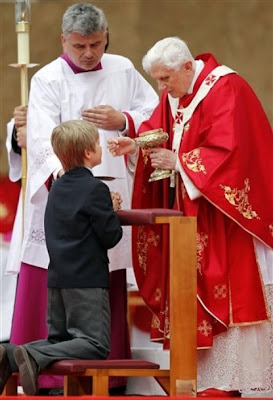 As people of faith, he said, "we should particularly cherish" the "right of a child to know and to love God." "Children also have a right to know God's love for them," Cardinal Brady added. 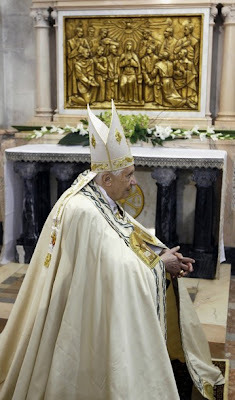 He continued: "They have a right to receive the truth and life which God offers them in the Sacred Scriptures, in the sacraments and in prayer. "If we really believe that Jesus Christ reveals the whole truth about the human person, then children have a right to receive that truth. "If we really believe that the message of Jesus Christ is the key to a better world and the source of our eternal hope, then children have a right to be part of a school community in which Jesus and his message are lived, respected and promoted." How is the New Commandment "New"? In the Old Testament, God already gave the commandment to love, so what makes Christ's "new commandment" something new? 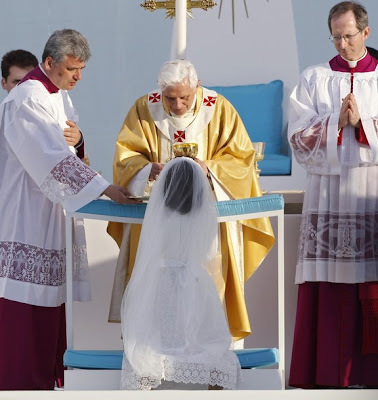 Benedict XVI answered this question today in Turin where he celebrated Mass this morning during a one-day trip to the city. "Giving us the new commandment, Jesus asks us to live his own love, which is the truly credible, eloquent and efficacious sign that announces to the world the Kingdom of God." Image Source: AP Photos. 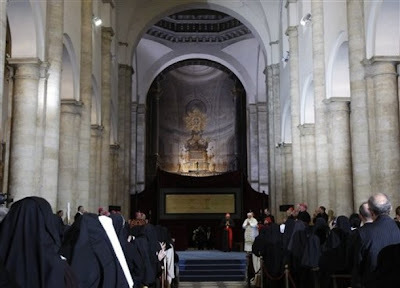 Pope Benedict XVI, white figure at center on stage, prays in front of the Holy Shroud in Turin's cathedral, Italy, Sunday, May 2, 2010. Benedict XVI prayed before the Shroud of Turin, believed to be Christ's burial cloth. Solemn High Mass for the Feast of St. George at St. Mary's Church, Chislehurst, 23 April, 2010. Celebrant is Fr. Charles Briggs, (Parish Priest, Chislehurst) Deacon is Fr. Tim Finigan (Parish Priest, Blackfen) and Sub-Deacon is Fr. Christopher Basden (Parish Priest, Clapham Park.). The background music (used with permission) is Mass I from Chants of the Ordinary, Volume I, by Cantus Angeli, directed by Nick Gale. 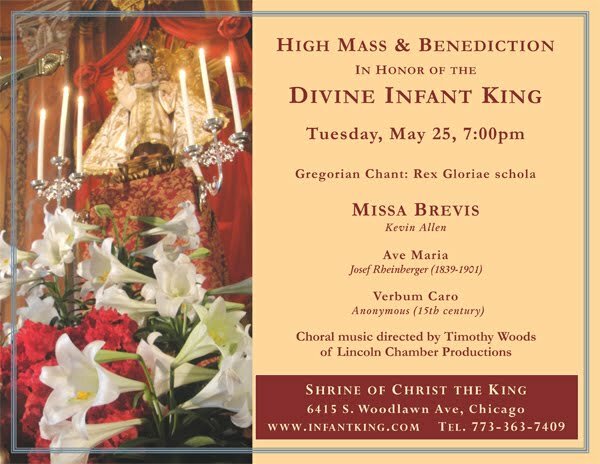 Copies of the CD can be obtained from Gregorian Chant.